Kids love toys. It’s true. I love educational toys, because playtime can absolutely be learning time, especially if you provide the right tools. I’ve put together a gift guide that will help you find the perfect toys to spark imagination and a love of learning in your child. I don’t have these listed out by age, but it’s important to note that paper, crayons, markers, paint, and other art supplies are educational toys. A fresh new set of art supplies is always a great present. This post contains affiliate links. If you use them and make a purchase, I receive a small commission at no extra cost to you. Edushape Educolor Building Blocks: Soft, foam blocks are great for little hands to use in building. These blocks are also great for teaching colors and shapes. Foam Bath Letters and Numbers: Help your kids have fun in the tub and learn their numbers and letters at the same time with these classic foam toys. They stick to the tub walls when wet. Books! I have a list of the best books for babies and toddlers. Melissa & Doug Deluxe Standing Easel: I love this easel because it has both a dry erase board and a chalkboard as well as a paper roll holder, clips, and large plastic art supply trays that are easy to remove for cleaning. Kids will spend hours creating art with this great toy. Educational Insights GeoSafari Jr. My First Telescope: This telescope will help you get your kids excited about space. 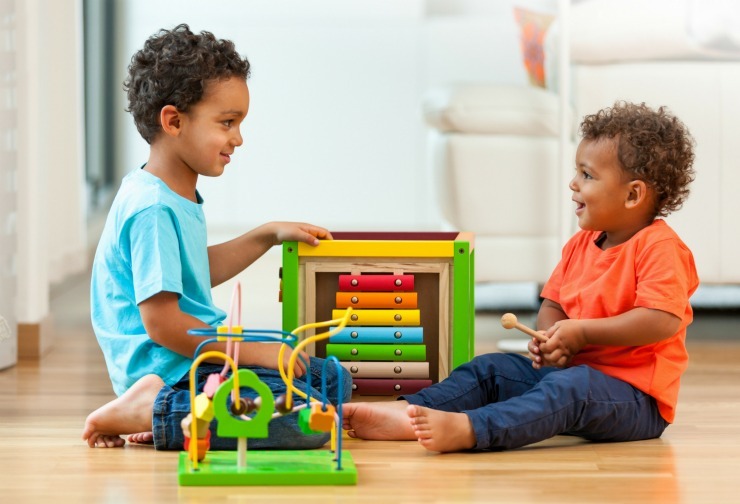 It’s sturdy construction is great for toddlers, and will help them get comfortable using scientific tools. BLAGOO Building Blocks: Three toys in one, this is a toy building set, car toy, and there’s a fun surprise inside, too! The blocks come in seven different shapes and colors and are great for building. Educational Insights Design & Drill BrightWorks: Creativity, building, and dancing lights! This toy will be a new favorite for any kid. It helps to develop hand-eye coordination, problem-solving, and fine motor skills. Kids can follow the provided patterns, and get creative with creating their own. Learning Resources Mix and Measure Activity Set: Measuring is a key skill for STEM skills. Kids will love these brightly colored tools and scale. Box includes activity cards with directions for making goo, paint, slime and more! Magformers: This building toy uses squares and triangles with rare-earth magnets to connect and build. You can buy Magformers specialty sets to expand your collection, but even the standard starter kit will provide hours of creative fun. Kids First Robot Engineer Kit and Storybook: I love this set! The book has a fun story about kids building robots in a candy factory. Your kids get to build their own robot as they read through the book, bringing the concepts to life with moving parts, wheels, and gears. Kids First has a whole series of these sets, covering aircraft, cars, amusement parks, and more! Books! I have a list of the best books for preschoolers and kindergarteners. Math Builder Board Game: This game is basically math scrabble. Kids will develop math equations and build their skills in addition, subtraction, multiplication, and division. littleBits Electronics Gizmos & Gadgets Kit: Your little inventors will love this set of electronic building blocks, accessories, and tools to create all the gadgets and gizmos they can imagine. ZOOB Builderz Deluxe S.T.E.M Challenge: Kids will use the ZOOB building pieces to solve challenges by building wacky creations like catapults, zip lines, trampolines, and more. Creativity for Kids Grow ‘n Glow Terrarium: Kids will build their own habitat with this kit that includes everything they need for two full plant life cycles. Glow in the dark stickers will light up the terrarium at night. It’s a great mix of art and science. American Girl Historical Dolls, Books, and Accessories: I still remember the year I received my American Girl doll for Christmas – it was magical! The BeForever historical characters bring history to life and help teach your kids about important moments in American history. Books! I have a list of the best books for elementary students. SmartLab Toys Squishy Human Body: This toy helps your kids take a tour of the human body as they take apart and re-assemble the model with bones, muscles, and squishy organs. OWI 14-in-1 Solar Robot: Help your kids build their own solar-powered robot with OWI. There are two levels of building skill, so it’s great for beginner or more advanced robot builders and the robot has 14 modes. National Geographic Hobby Rock Tumbler Kit: Everything your kids need to start a rock collection and learn about rocks and gems. Books! In addition to the books for elementary students, I have a list of the best books for teens and tweens with great suggestions for your advanced readers. Subscription boxes are fun, because a new surprise lands in your mailbox each month. Here are a few educational subscription boxes for kids that I love. Little Passports Global Adventure: With boxes for kids ages 3-12, this subscription box teaches your kids about countries and cultures. They also have specialty boxes that focus on the United States and science expeditions. Kiwi Crate: With boxes for kids ages 2-16, this subscription box mixes art, science, design, and innovation. BitsBox: With boxes for kids ages 6-12, this box introduces a new computer science concept each month with fun app projects.